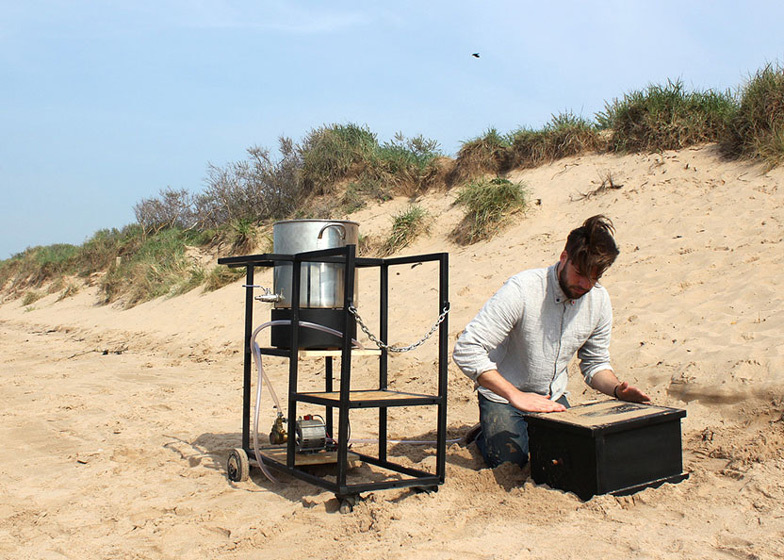 Edinburgh College of Art student Peter Trimble has built a portable machine for manufacturing furniture from sand, urine and bacteria (+ slideshow). As part of his thesis project, Peter Trimble explored how bacteria and the urea found in urine might be used to create a reusable material that requires fewer resources than conventional concrete. His solution was Dupe, a portable device that injects a liquid solution into a mould full of sand that bonds the grains together, creating a material called biostone. This biodegradable substance has similar qualities to concrete, but can be broken up and used as a fertiliser for crops. It also produces no greenhouse gases and uses a widely available raw material. 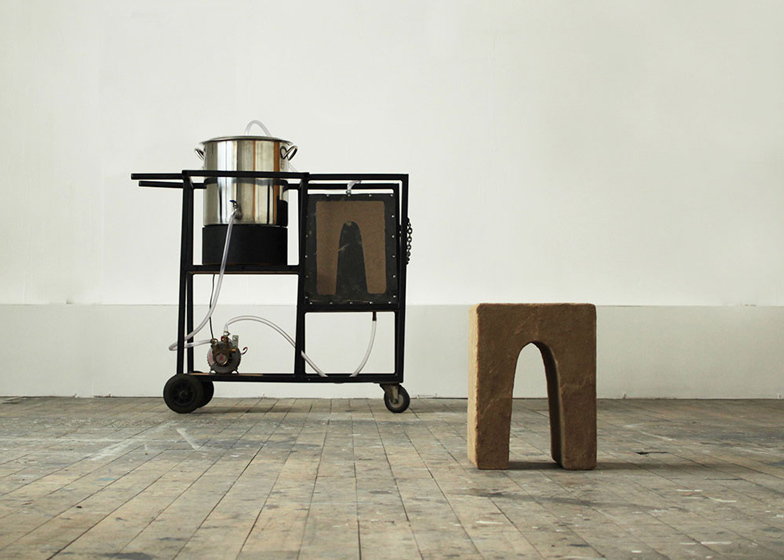 Trimble's machine is currently set up to produce a small stool and is made up of a pump from an old coffee machine, a mixer from an old blender, a mould, and a tank to hold liquid. The mould is filled with sand and sealed, while in a separate tank, the bacteria bacillus pasteurii - commonly found in soil - is grown in a nutrient broth to help it multiply. The solution is then pumped through the sand and left to establish itself between the sand particles overnight. The next day, calcium chloride, urea, and more nutrient broth are added to the process. The urea acts as a fertiliser and encourages the bacteria to flourish before it combines with the calcium chloride to form calcite, a sticky substance that glues the grains of sand together. After two days, the process is complete. 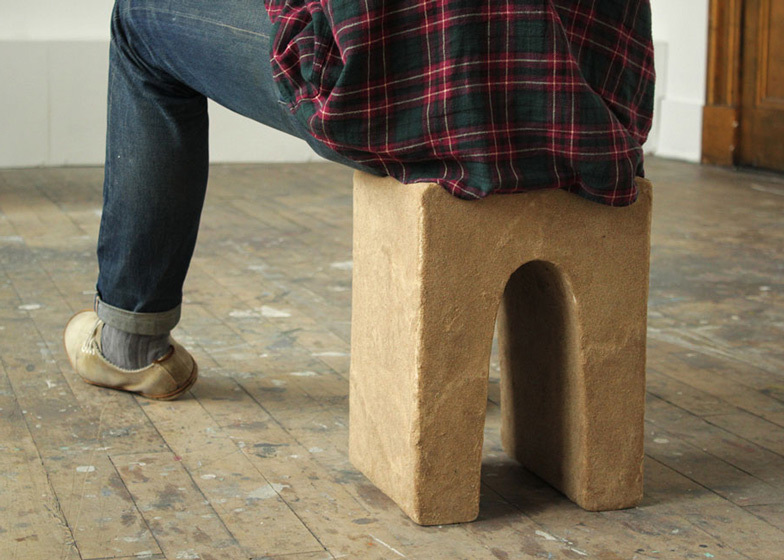 The result in this case is a stool capable of supporting 91 kilograms of weight, but the designer says the process could also be used to produce bricks or other building materials, particularly in sub-Saharan Africa where sand is widely available. Trimble believes this low-tech technique could be used to offset the energy used in concrete manufacturing. "Concrete is responsible for five per cent of global carbon dioxide," he explained. "Dupe is a low cost production method using very little energy and sand, a cheap and abundant raw material." He said that one kilogram of concrete requires 5.6 megajoules of energy to produce, whereas the equivalent amount of biostone made through his own method uses just 0.9 megajoules. While Trimble's biostone would require reinforcement to be as strong as concrete, it could become a low-cost way of building temporary structures or street furniture. Students from Barcelona's Institute for Advanced Architecture of Catalonia did precisely that when they created architectural structures from sand in 2012 using their Stone Spray Robot. On a slightly smaller scale, Paris-based studio Bold-design produced an activity kit that uses bacteria to turn sand from the beach into stone souvenirs.